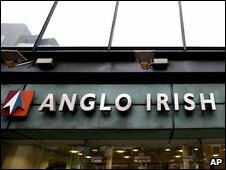 The Belfast office of Anglo Irish Bank is at the centre of an investigation after it accidentally released information on 500 UK customers. A bank executive emailed a Northern Ireland client a spreadsheet containing details of derivatives transactions carried out on behalf of the customers. The bank has informed financial regulators in Dublin and London and is contacting the 504 customers involved. It said there is no security risk to any client's accounts. The mistake happened when a customer asked for a quotation on a derivative product on October 29th. The banker sent the quotation but also attached confidential information on 803 transactions carried out for 454 corporate clients and 50 individuals. According to Irish state broadcaster RTE the bulk of the clients are British-based property development companies and the transactions were worth 12.5bn euros (£11.3bn). The bank did not know it had made the mistake until it was told about it last week. As well as contacting the customers and regulators it has also informed the UK's Information Commissioners Office. The banks said it was taking the matter "very seriously" as data relating to a client should only be capable of being sent to that client or to a person authorised by that client. Anglo Irish Bank grew rapidly during Ireland's boom years, specialising as a lender for property development. It was almost wiped out by the property crash and was nationalised earlier this year. Several official investigations, including a fraud inquiry, are still under way.